Wandsworth SW Domestic & Commercial Window Cleaning | Quality Property Care Ltd.
To accomplish our well-known final results we apply a simple water-purification method which strips away regular tap water from its minerals. This leaves it a basic H2O molecule which is a lot lighter and sticks a lot more to mud, dirt and grime. The technique is a very efficient way of cleaning away even the dirtiest of window surface types and can reach up to 4 stories in height. Working with a telescopic water-fed pole we clean the window sills and windows from the bottom to top using only water, no detergents as detergent bring in even more dirt if not rinsed with water. Additionally detergents may have corrosive properties on PVC surface types and cause the seals and gasket of the windows to rot and decay faster. The length of the water fed pole enables us to clean business buildings without having to use a ropes or ladder. Rope systems are available for commercial clients, get in touch with us at 020 3746 4287 for more information. 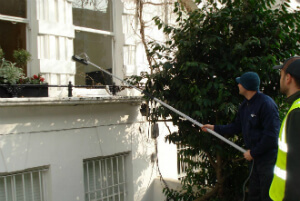 Quality Property Care Ltd. is a highly rated window cleaning company in Wandsworth SW. It was founded back 10 years ago. Through the years we have realized that customer`s satisfaction is the best price we have from our services. The domestic and commercial window cleaning service is one of our top work based on fast speed, innovative strategy and minimum risk for the clients and the window cleansing agents. Dear clients, Quality Property Care Ltd. company completely ensure you that your property or home is under security. The crew we send to you is composed of covered and well-trained window cleaners. They are motivated, devoted and diligent. You are not even required to remain in the home during window cleaning in Wandsworth SW. All you have to do is to keep us some parking space, so the friendly technicians can park the van with the water fed pole product. In case of any omission, we handle the damages or re-do the procedure for free! Your final consumer satisfaction is confirmed. We are offering a suitable outside window cleaning for displays, big bay windows, for shops, garden windows, domestic buildings up to 4 stories in height, conservatories and even gutters and patios. If you have a shop on a busy block and want that window cleaned, we can cope with your needs, no hassle or extra fees. We deliver our own devices, fully set to tackle any stain or window cleaning situation that you want fixed. We bring ladders, gloves, detergents, towels squeegees, vacuum, dirt extractors, telescopic poles for the squeegee and some pure water. To maintain the inside of your property clean, our crew uses overshoes to minimize the dirt visibility of the windows. Based on the spills in question, we use a detergent or simple water . Often a wipe down with a micro fiber cloth to get rid of fingerprints is enough. This is done using our water purification system connected to a water fed pole. The whole system sits compactly in the van, allowing for mobility. A water purifier strips standard tap water off of its minerals and other chemicals, leaving it a bare H2O compound. This form of water is known as purified water, it links a lot more quickly to dirt and grime due to its denaturalized state. There is no trick, no smoke and mirrors, no tricks, just simple pure tap water removing accumulated grime and dirt form your windows. Our cleaner starts from top to bottom, beginning with proper window frame and sill cleaning to removing any grit and debris, then he moves onto the glass itself. If the day is especially windy we hand dry the window with cloths to avoid further saturation. Feel free to book our budget-friendly and eco-friendly window cleaning support now! We are available on 020 3746 4287! Receive a totally free quote now or use the direct online booking form for direct reservation!